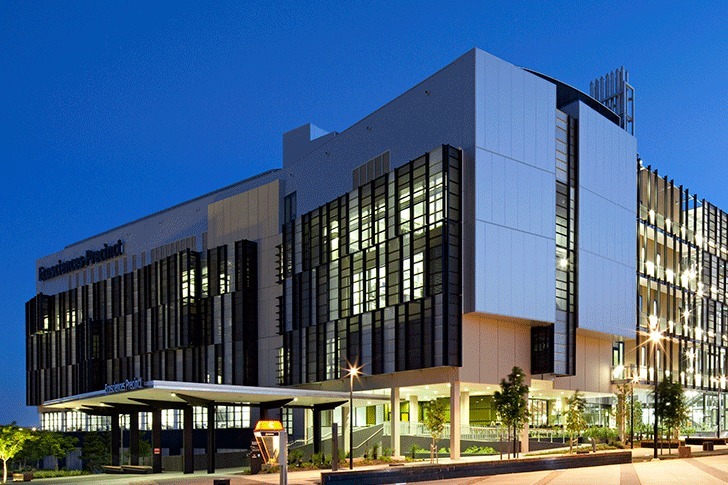 The dynamic Ecosciences Precinct in Brisbane is home to over 1,000 scientists from various government agencies in Queensland all working at the forefront of climate change and environmental research. Designed by HASSELL, the eco laboratory is also on the cutting edge of energy efficient and sustainable design. In collaboration with a team from Arup, HASSELL developed a sustainability rating tool for the project measuring factors in laboratories that were previously not addressed by existing Australian Green Building Council tools. The 4 Star Green Star rated multi-disciplinary science laboratory now serves as a model for all new labs in Australia. The Ecosciences Precinct is a collaborative project involving Queensland’s Department of Environment and Resource Management, Department of Employment, Economic Development and Innovation and the Commonwealth Scientific and Industrial Research Organisation (CSIRO). The goal of the new 50,000 sq meter laboratory facility is to encourage collaboration and communication between disciplines and agencies. Three north-orientated wings are linked by an internal multi-level street which encourages scientists and researchers to get out of their labs to meet with each other in a lively hub with common areas. Located in Dutton Park and part of the redevelopment of Brisbane’s old Boggo Road Gaol site, the Ecoscience Precinct provides lab, research and office space dedicated to climate change, healthy environments, balanced growth and sustainable industries. The four story building has a roof top level greenhouse, a clean floor for IT, two basement levels for boats, 4WDs, marine and greenhouse processing and a controlled environment room complex. Some of the facilities are shared and used by the research population at large, which generated space savings and created economies of scale. The eco lab as a whole employed a number of sustainable strategies focusing on northern orientation, passive solar design, extensive sun-shading, advanced building control systems, energy, water and waste efficiency. As Brisbane enjoys 300 days of sunshine a year, the building was designed to minimize solar heat gain but filter the harsh, sub-tropical sunlight. To do this, the building makes use of a perforated aluminium veil to create filtered light in large indoor spaces. Arup and HASSELL also cooperated to address sustainability standards for laboratories resulting in a sustainability rating tool, which helped them achieve a 4 Star Green Star rating. The Ecosciences Precinct is a collaborative project involving Queensland Government agencies - the Department of Environment and Resource Management, the Department of Employment, Economic Development and Innovation and the Commonwealth Scientific and Industrial Research Organisation (CSIRO). The goal of the new 50,000 sq meter laboratory facility is to encourage collaboration and communication between disciplines and agencies. Three north-orientated wings are linked by an internal multi-level street creating a mini city within the facilities, which encourages scientists and researchers to get out of their labs to meet with each other in a lively hub with common areas and meeting areas. 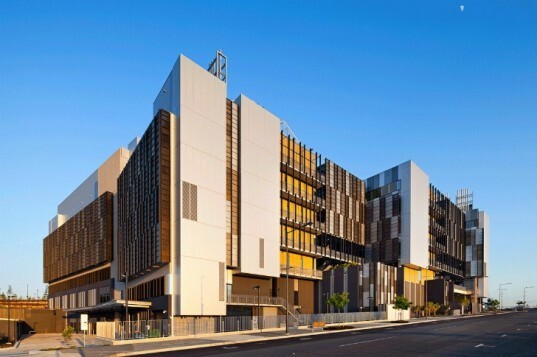 Located in Dutton Park and part of the redevelopment of Brisbane's old Boggo Road Gaol site, the Ecoscience Precinct provides lab, research and office space dedicated to climate change, healthy environments, balanced growth and sustainable industries. The four story building has a roof top level greenhouse; a clean floor for IT, sterilisation, media preparation and plant; two basement levels for boats, 4WDs, marine and greenhouse processing; and a controlled environment room complex, central stores and goods management. Some of the facilities are shared and used by the research population at large, which generated space savings and created economies of scale. The eco lab as a whole employed a number of sustainable strategies focusing on northern orientation, passive solar design, extensive sun-shading, advanced building control systems, energy, water and waste efficiency. As Brisbane enjoys 300 days of sunshine a year, the building was designed to minimize solar heat gain, but filter the harsh, sub-tropical sunlight. To do this, the building makes use of perforated aluminium veil to create filtered light in large indoor spaces. Arup and HASSELL also cooperated to address sustainability standards for laboratories resulting in a sustainability rating tool, which helped them achieve a 4 Star Green Star rating.